Fabulous large size pair of English Staffordshire figures Victoria, Queen of England and her son, Edward prince of Wales. Both in elegant period Dress: Ermine cloaks, sashes, the queen having tiered dress, jewels and crown, with overglazed gilt touches. The prince with emblems and feathers. Both with blue eyes. Most rare to get the pair in pristine condition. Excellent molding and coloration. Pair of English Staffordshire highland Gents with plumed hats and shawls and kilts and gilt spotted horses with three separate legs. Perfect condition. “Will Watch” an English Staffordshire swash buckling pirate with rum kegs two pistols and a rifle, yellow floral pantaloons, plumed hat and rose stockings. Excellent conditions. Pair of English Staffordshire water well spills girl and boy with his pet bird, water pitcher. Provenance: Hampton Court Isle of Man. Restoration to spills. 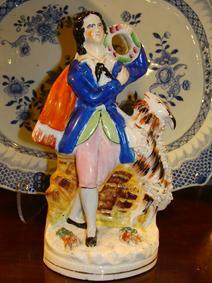 Pair of English Staffordshire figural of gardeners. White ground with baskets and topiaries in a landscape. English Staffordshire figural, bride and groom with bouquet and bridal basket. Frits on groom’s face. Colorful English Staffordshire clock figural with gent in cobalt tartan and plumed hat with bagpipes, his lady with wrap, cobalt and floral dress. Clock with flowers in landscape. In making line, perfect condition. Pair of English Staffordshire tartan skirted dancers on orange base. One foot restored. English Staffordshire highland huntsman on horseback with his catch. Perfect condition. English Staffordshire hunt theme grapevines watch hutch with Scottish couple in cobalt and yellow, with whippet and bird. Two tiny nicks otherwise in excellent condition. Large size Staffordshire figure of a brightly clad red riding hood with wolf/fox and basket of provisions. Restoration to fox ear otherwise excellent condition. English Staffordshire highland dancer with white coat and tartan sash. English Staffordshire figural of girl and boy in a landscape with their large dog. Chip to base. English Staffordshire wheat gatherers, she is in a tartan skirt. Tiny chip on his hat. English Staffordshire figural of young lady and man at the water well in colorful garb with green water buckets. Charming Staffordshire figure of two children at the water well. Excellent condition. Colorful English Staffordshire goat herder in “French Blue” coat charming a parsleyed goat. Excellent condition.